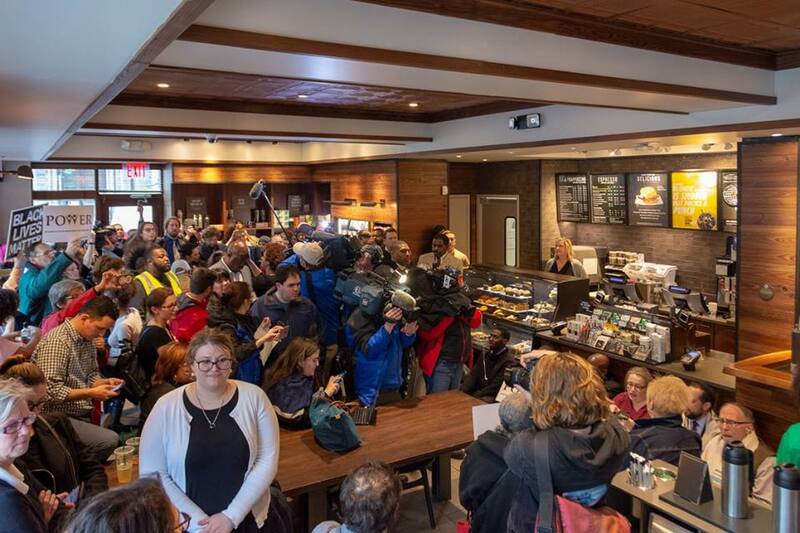 Philadelphians Organized to Witness Empower and Rebuild (POWER) staged sit-ins at two separate Starbucks in Center City Monday evening, protesting what they called the racial profiling and arrest of two Black men in the Starbucks on 18th and Spruce streets on Thursday. “The outrage is that even though the situation has occurred and even though everyone says over and over, ‘We apologize, we are sorry,’ except for our police commissioner, the simple fact is that Starbucks, as part of its business model, looks for areas that are gentrified … to be a safe haven. A safe haven to who? Certainly not to two African-American men who were sitting there last Thursday,” said the Rev. Gregory Holston, POWER executive director. POWER also listed demands for the Philadelphia Police Department, which include a review and discussion of “implicit bias” training, de-escalation techniques and body camera use policy. “When [youth] tell us they are stopped by police, and they go in their underwear fondling them, saying they are looking for drugs, it has to be true,” Tyler said in a speech at the protest. Tyler added that Police Commissioner Richard Ross’ stance was disappointing even as Starbucks leadership and Mayor Jim Kenney acknowledged the two men should not have been arrested. Prior to the POWER protest, several City Council members — including Kenyatta Johnson, Blondell Reynolds Brown and Helen Gym — denounced the incident. Councilman Derek Green and Rev. Kevin Johnson, a congressional candidate in the Third District, did so as well.